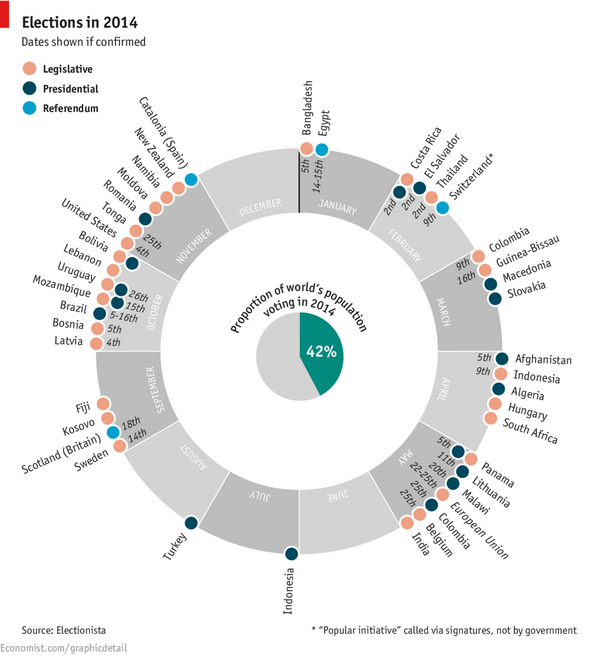 2014 could be considered “an electoral feast” as 42% of the world’s population was called to vote. Such staggering number was set due to the fact that 42 countries carried out elections, and among them, 10 from Latin America. The balance of the year for Latin America shows Brazil further strengthening its supremacy in electoral automation, while Panama, Paraguay, Costa Rica and Ecuador taking firm steps to modernizing their voting systems. Ecuador carried out the most complex test, as it experimented with two different technologies during the February elections. The province of Santo Domingo de los Tsáchilas used Smartmatic’s touchscreen voting machines that print a vote receipt on paper. Meanwhile, in Azuay, the electoral body deployed an electronic tallying system designed by Argentina’s MSA. Paraguay, which joined the elite of countries with electoral regulations for the implementation of e-voting in 2013, announced that it is currently evaluating whether it will repeat last year’s experience, in which 17,000 Brazilian voting machines were used. Costa Rica showed its people the technology it hopes to adopt for the upcoming 2016 elections, by letting voters interact with the voting machines designed by the High Electoral Court (TSE). Meanwhile, during its general elections in May, Panama tested out technology developed by the Electoral Court (TE), which reproduces features from systems already tested in other countries, such as a card-activated touchscreen machine displaying candidates to press on in order to vote. Peru became the only “black spot” in a year of electoral successes. Instead of building on the system designed designed by the National Office for Electoral Processes (ONPE), the nation opted to approve a not very transparent tender bid for the development of the automated system’s software. This has sparked a lot of problems, and will force the country to revise its application in future elections. Finally, Brazil once again showed the world why it is considered one of the world leaders in vote automation. Its large, election-tested platform was deployed twice in October.